Update - please see additional FOIA information at end of post. "One of my clients was directly threatened by the White House and in essence compelled to withdraw its opposition to the deal under threat that the full force of the White House press corps would destroy its reputation if it continued to fight...That was Perella Weinberg." In the clip below, fast forward to the two minute mark, where the Obama administration's negotiating tactics become very, very clear. What is very odd is that Perella Weinberg could possibly have veered away from the administration's path in the first place: Zero Hedge readers know that P-W is the very firm advising the rapidly sinking FDIC "on transactions and strategies to stabilize the banking system, and also on the proper way to dispose failed institutions and how to handle delinquent securities assumed from banks, as well as the creation of the aggregator bank." This leads to the conclusion that this was really the work of one Dan Arbess, who runs the recently acquired by P-W, Xerion Capital, but nonetheless does not explain the lack of strategic integration at this most critical of advisors to Sheila Bair, and by implication the U.S. administration. How it is possible that one's core advisor would go against its client, even if offset by a Chinese Wall, is likely the big story here, and speaks volumes about the chaos behind the scenes currently occurring with regard to Wall Street's sentiment for the ruling administration. Incidentally, Zero Hedge is considering launching a FOIA to Ms. Sheila Bair to disclose the compensation structure for Perella Weinberg as it continues to advise the FDIC on the "proper" shuttering and liquidation of bank after bank. After all, we have already seen 31 bank failures for 2009, a number that will likely hit the 100s, and it is every taxpayer's right to understand the motivations behind Perella-Weinberg's recommendations to the FDIC and to the White House, especially ahead of next week, when the stress test results could potentially lead to the closure of some of the "too big to fail" systematically important financial institutions. - First lien holders were willing to accept a 50% discount on their positions, however the 71% demanded by the administration was seen as too much. - The cash going to Junior claims (creditors below the first liens) will be between $10 and $20 billion, a number which in practice should satisfy a par recovery for the 1st liens if the Absolute Priority Rule was actually withheld. - Among the creditors are not just vulturous hedge funds but "pensioners, teachers, credit unions, college endowments, retirement plans, and personal retirement accounts." "The President is trying to abrogate contractual rights; if he will attack that contractual right, what right will he not attack?" Update: Zero Hedge urges our readers to click on the following link and submit a FOIA to the FDIC with regard to the abovementioned Perella Weinberg compensation matter. While one request will likely be ignored, as will ten or a hundred, if there are thousands of FOIA petitions, the FDIC may see it as their civic duty to provide the requested information. While you are at it, you may also request information on the remaining balance under the FDIC's Deposit Insurance Fund. Regardless, there might have been a significant disturbance in the force today. We shall see if it persists. Treasury recognizes that this is an extraordinary and unprecedented case. Given the importance of Chrysler to the American economy, and the path to viability Chrysler has presented to Treasury, Treasury stands prepared to support Chrysler in this endeavor. Its support, however, is limited, and in the end it will be the actions of Chrysler and its constituents, and their willingness and ability to resolve their issues under the supervision of this Court, that will determine whether Chrysler survives. The mandated series of events, as cataloged in the filing presented below, demands that Chrysler has to i) file a motion to approve the sale by May 4, ii) win approval of proposed bidding procedures by May 9, iii) receive any competing offers by May 20 and iv) complete the sale by June 27. Additionally the filing discloses that Fiat will be a stalking horse bidder in partnership with the Chrysler employees VEBA, holding a 55% stake, the US Treasury with 8%, and the Canadian government agency Export Development Canada with 2%. As part of the ultimatum, the U.S. will extend a $4.7 billion first lien loan to New Chrysler only if the deal with Fiat is completed. And for the record, the Debtor in Possession loan from Uncle Sam will carry a 5% interest rate. The last memorable words of ominosity from Dassin were the following "Treasury must be a careful and vigilant guardian of the public’s money, however, and accordingly its support for Chrysler’s revitalization must be limited." The game of chicken, which Obama keeps on losing and petulantly blames hedge funders every single time, continues. And as for the list of treacherous, treasonous patriots who dares stand up to the wave of ever encroaching socialization, the list of all secured creditors is presented below. The 20 of them who dared to be demonized in public for standing up to for fiduciary responsibilities deserve a medal once this whole situation is blown over... Unfortunately it won't happen as they are likely the very same ones who will soon bear the brunt of public anger yet again, when it is General Motors that files for bankruptcy on May 31. WSJ out with a stunner, explaining the reasons behind the delay of the stress test releases until May 7th. And if Citi, which already has done some massive creeping equitization of its preferred stock is still in this much pain, one can only imagine what lies in store for Bank of America and even Wells Fargo. Citigroup Inc. may need to raise as much as $10 billion in new capital, according to people familiar with the matter, as the government continues negotiations with banks over the results of its so-called stress tests. The bank, like many others, is negotiating with the Federal Reserve and may need less if regulators accept the bank's arguments about its financial health, these people said. In a best-case scenario, Citigroup could wind up having a roughly $500 million cushion above what the government is requiring. For certain banks who can't raise new funds from private investors, federal regulators are allowing banks to consider giving the government stakes in their common equity, people familiar with the matter say. That would help fill their capital needs but would also raise thorny questions about how close a role the U.S. will play in their daily operations. The outcome of the stress tests could play a major role in shaping the next phase of the U.S. government's intervention in the nation's ravaged financial system. After the results, banks will have 30 days to give the government a plan and six months to put it into effect. The banks are expected to reveal their plans next week. Concerned about investor and depositor panic, government officials have said banks needing more capital should not be viewed as being at risk of collapse. In fact, the government has said it would not allow any of the 19 banks undergoing the test to fail. Banks have been scrambling over the past week to refute the Fed's preliminary conclusions. Bankers say those negotiations are part of the reason the government has pushed back its announcement of the results. "The gloves have been taken off, and there's some real battles going on right now," said Gerard Cassidy, a bank analyst with RBC Capital Markets. Some banks are haggling with the Fed over how it calculated their projected 2009 and 2010 revenues -- a central factor in gauging banks' ability to absorb losses. Some have pushed the Fed to use their strong first-quarter performances as a baseline, even though many acknowledge their first-quarter results are likely unsustainable. They are haggling with the Fed based on their "strong" first quarter results (which were all due to taxpayer gifts to every single bank via the AIG funnel)? Come again? Are there any boards of directors left at any of these firms to supervise the sheer lunacy that management teams projectile vomit in the general direction of Barak Obama, Tim Geithner and CNBC's audience? Why should Chrysler creditors be forced to suffer and be scapegoated in front of the entire world, while we don't know who one single large creditor of a Citi or of BofA is? .... but we can speculate...Hey Obama/Tim - how about some bank creditors suffer a loss here and there too in your witch hunt against "all those self-serving Wall Streeters." Does it maybe have to do with the fact that these are not really Wall Streets at all but the very same gullible fools who are supposed to lap up the $1 trillion + in USTs you will be shovel feeding over the next year... yes, the same investors who still have their investment in Freddie and Fannie marked at par compliments of Uncle Sam and Joe Taxpayer. All is good though: CNBC just announced that all is priced in, and that no bad news can ever move the market lower as everything negative has been factored in every single stock price in perpetuity and then some. Enough with the hypocrisy! When is Lewis Black going to do a Wall Street special? The creation of the bridge bank allows the client banks to maintain their correspondent banking relationship with the least amount of disruption. The FDIC will operate Silverton Bridge Bank, N.A., to allow preexisting marketing efforts for the bank to continue. There goes another $3.3 billion that previously was part of the increasingly minuscule (if not currently negative) Deposit Insurance Fund. Maybe Ms. Sheila Bair can provide her employer (the U.S. taxpayers) with an update of just what the current status of the DIF is these days: been a while since we got one of those. Bank #2 is Citizens Community Bank of Ridgewood, NJ. The FDIC estimates that the cost to the DIF will be a mere $18.1 million. The bank had $45.1 million of total assets and $43.7 million in total deposits. Citizens Community Bank, Ridgewood, New Jersey, was closed today by the New Jersey Department of Banking and Insurance, which appointed the Federal Deposit Insurance Corporation (FDIC) as receiver. To protect the depositors, the FDIC entered into a purchase and assumption agreement with North Jersey Community Bank, Englewood Cliffs, New Jersey, to assume all of the deposits of Citizens Community Bank. The failed bank's sole office will reopen on Monday as a branch of North Jersey Community Bank. Depositors of Citizens Community Bank will automatically become depositors of the assuming bank. Deposits will continue to be insured by the FDIC, so there is no need for customers to change their banking relationship to retain their deposit insurance coverage. Customers of both banks should continue to use their existing branches until North Jersey Community Bank can fully integrate the deposit records of Citizens Community Bank. Bank #3 is America West Bank of Layton, Utah. The FDIC estimates that the cost to the DIF will be a mere $119.4 million. The bank had $299.4 million of total assets and $284.1 million in total deposits. America West Bank, Layton, Utah, was closed today by the Utah Department of Financial Institutions, which appointed the Federal Deposit Insurance Corporation (FDIC) as receiver. To protect the depositors, the FDIC entered into a purchase and assumption agreement with Cache Valley Bank, Logan, Utah, to assume all of the deposits of America West. The failed bank's three offices will reopen on Monday as branches of Cache Valley Bank. Depositors of America West Bank will automatically become depositors of the assuming bank. Deposits will continue to be insured by the FDIC, so there is no need for customers to change their banking relationship to retain their deposit insurance coverage. Customers of both banks should continue to use their existing branches. Spreads were broadly wider in the US as all the indices deteriorated. Indices generally outperformed intrinsics (as we see high beta shorts selling index protection as hedges) with skews widening in general as IG's skew decompressed as the index beat intrinsics, HVOL outperformed but widened the skew, ExHVOL outperformed pushing the skew wider, XO's skew increased as the index outperformed, and HY's skew widened as it underperformed. The names having the largest impact on IG are CIT Group Inc (-146.87bps) pushing IG 0.8bps tighter, and Hartford Financial Services Group (+44.73bps) adding 0.33bps to IG. HVOL is more sensitive with CIT Group Inc pushing it 3.67bps tighter, and Hartford Financial Services Group contributing 1.5bps to HVOL's change today. The less volatile ExHVOL's move today is driven by both Toll Brothers, Inc. (-10bps) pushing the index 0.1bps tighter, and Time Warner Cable Inc. (+13bps) adding 0.13bps to ExHVOL. The price of investment grade credit fell 0.08% to around 97.22% of par, while the price of high yield credits fell 0.13% to around 79% of par. ABX market prices are higher (improving) by 0.13% of par or in absolute terms, 0.37%. Broadly speaking, CMBX market prices are lower by 0.46%. Volatility (VIX) is down 1.2pts to 35.31%, with 10Y TSY selling off (yield rising) 3.8bps to 3.16% and the 2s10s curve steepened by 3bps, as the cost of protection on US Treasuries fell 0.67bps to 38bps. 2Y swap spreads widened 1.9bps to 58.13bps, as the TED Spread tightened by 2.8bps to 0.86% and Libor-OIS improved 3.6bps to 78.7bps. The Dollar weakened with DXY falling 0.05% to 84.572, Oil rising $2.16 to $53.28 (outperforming the dollar as the value of Oil (rebased to the value of gold) rose by 4.47% today (a 4.18% rise in the relative (dollar adjusted) value of a barrel of oil), and Gold dropping $2.07 to $886.13 as the S&P rallies (872.2 0.25%) outperforming IG credits (164.75bps -0.08%) while IG, which opened tighter at 161.25bps, outperforms HY credits. IG11 and XOver11 are +2.75bps and +5.88bps respectively while ITRX11 is +5.66bps to 143.5bps. Dispersion fell -5.4bps in IG. Broad market dispersion is a little greater than historically expected given current spread levels, indicating more general discrimination among credits than on average over the past year, and dispersion decreasing more than expected today indicating a less systemic and more idiosyncratic narrowing of the distribution of spreads. 54% of IG credits are shifting by more than 3bps and 61% of the CDX universe are also shifting significantly (less than the 5 day average of 63%). The number of names wider than the index stayed at 43 as the day's range rose to 10bps (one-week average 9.35bps), between low bid at 159.5 and high offer at 169.5 and higher beta credits (3.36%) underperformed lower beta credits (3.04%) as we see derisking popular again. In IG, wideners outpaced tighteners by around 5-to-1, with 100 credits wider. By sector, CONS saw 81% names wider, ENRGs 81% names wider, FINLs 62% names wider, INDUs 82% names wider, and TMTs 91% names wider. Focusing on non-financials, Europe (ITRX Main exFINLS) underperformed US (IG12 exFINLs) with the former trading at 143bps and the latter at 131.83bps. Cross Market, we are seeing the HY-XOver spread compressing to 335.35bps from 336.17bps, but remains below the short-term average of 390.64bps, with the HY/XOver ratio falling to 1.41x, below its 5-day mean of 1.47x. The IG-Main spread compressed to 21.25bps from 24.91bps, and remains below the short-term average of 24.06bps, with the IG/Main ratio falling to 1.15x, below its 5-day mean of 1.16x. In the US, non-financials underperformed financials as IG ExFINLs are wider by 4.5bps to 131.8bps, with 12 of the 104 names tighter. while among US Financials, the CDR Counterparty Risk Index rose 3.65bps to 230.77bps, with Brokers (worst) wider by 5.75bps to 290.83bps, Finance names (best) tighter by 10.48bps to 943.32bps, and Banks wider by 5.21bps to 290.44bps. Monolines are trading wider on average by 122.55bps (3.77%) to 2846.33bps. In IG, FINLs outperformed non-FINLs (0.27% tighter to 3.56% wider respectively), with the former (IG FINLs) tighter by 1.2bps to 454.4bps, with 7 of the 21 names tighter. The IG CDS market (as per CDX) is 10.1bps cheap (we'd expect LQD to underperform TLH) to the LQD-TLH-implied valuation of investment grade credit (154.62bps), with the bond ETFs outperforming the IG CDS market by around 4.67bps. In Europe, ITRX Main ex-FINLs (underperforming FINLs) widened 6.5bps to 143bps (with ITRX FINLs -trending tighter- weaker by 2.29 to 145.5bps) and is currently trading in the middle of the week's range at 44.64%, between 151.06 to 136.5bps, and is trending tighter. Main LoVOL (trend tighter) is currently trading in the middle of the week's range at 48.94%, between 108.58 to 95.95bps. ExHVOL outperformed LoVOL as the differential compressed to -5.36bps from -0.23bps, and remains below the short-term average of -3.34bps. The Main exFINLS to IG ExHVOL differential decompressed to 46.22bps from 40.78bps, and remains above the short-term average of 45.33bps. CDR LQD 50 NAIG091 +6.08bps to 223.67 (44 wider - 3 tighter <> 25 steeper - 24 flatter). CDX12 IG +1.75bps to 164.5 ($-0.07 to $97.23) (FV +3.64bps to 181.43) (99 wider - 19 tighter <> 61 steeper - 63 flatter) - Trend Tighter. CDX12 HVOL +5bps to 380 (FV +6.64bps to 489.37) (22 wider - 8 tighter <> 14 steeper - 16 flatter) - Trend Tighter. CDX12 ExHVOL +0.72bps to 96.45 (FV +2.8bps to 100.2) (77 wider - 18 tighter <> 48 steeper - 47 flatter). CDX11 XO +11.3bps to 377.7 (FV +14.93bps to 449.9) (27 wider - 4 tighter <> 9 steeper - 25 flatter) - Trend Tighter. wider - 38 tighter <> 42 steeper - 54 flatter) - Trend Tighter. LCDX12 (65% recovery) Px $+0.1 to $77.5 / -6.87bps to 1087.05 - Trend Tighter. MCDX12 +1.75bps to 193bps. - Trend Tighter. CDR Counterparty Risk Index rose 3.65bps (1.61%) to 230.77bps (12 wider - 3 tighter). CDR Government Risk Index fell 0.61bps (-0.9%) to 67.61bps. DXY weakened 0.05% to 84.57. Oil rose $2.16 to $53.28. Gold fell $2.07 to $886.13. VIX fell 1.2pts to 35.31%. 10Y US Treasury yields rose 3.8bps to 3.16%. In yet more bad news for the second derivative crowd, today's announcement of a 9.3 million SAAR took the green shoot cheerleaders to the woodshed. Not only has this number firmly planted U.S. auto sales in the robust and $3.5 billion Chrysler DIP-worthy level of the late 1970's, but it has also proven that last month's SAAR of 9.9 million was as legitimate as the 2.2% consumer driven improvement to GDP. But all is not lost - now that uncle Obama is personally guaranteeing the installation and the bimonthly oiling and dusting of mufflers, hubcaps, and transaxle scotch tape for all hedge fund managers who buy Chrysler cars, it is only a matter of time before the millions of unsold Dodge Rams fly off the cargo docks faster than they can be sent to China to moderate Beijing's anger over holding millions of rapidly devaluing metric tons of one-ply U.S. treasury paper. Below we present the summarized term sheet of the most recent reincarnation of the TALF, compliments of the Federal Reserve. NEW YORK—May 1, 2009—Commercial Mortgage Securities Association applauds today’s announcement by the Federal Reserve Board to extend the Term Asset-Backed Securities Lending Facility to commercial mortgage-backed securities with an increased five-year term. TALF is a central part of the U.S. government’s plan to encourage lending by restarting the market for various types of asset-backed securities. TALF recently became operational for consumer ABS with a three-year term for these assets. The Federal Reserve in its statement today said that, starting in June, TALF loans with five-year maturities will be available for the June funding to finance purchases of CMBS, ABS backed by student loans, and ABS backed by loans guaranteed by the Small Business Administration. “The inclusion of CMBS as eligible collateral for TALF loans will help prevent defaults on economically viable commercial properties, increase the capacity of current holders of maturing mortgages to make additional loans, and facilitate the sale of distressed properties,” the Federal Reserve said. The Federal Reserve also indicated that up to $100 billion of TALF loans could have five-year maturities and that the FRB will continue to evaluate that limit. “Extending TALF to CMBS with five-year terms is critical to providing liquidity and facilitating lending in the commercial mortgage market,” said Christopher Hoeffel, President, Commercial Mortgage Securities Association. “CMSA has strongly advocated for a term of five years to kickstart investor demand,” he said. “A five-year term is more consistent with the longer-term nature of commercial lending and will provide more flexibility to borrowers as they navigate the current real estate cycle,” he said. “CMSA and its members applaud the government and policymakers for extending TALF to CMBS and extending the term to five years,” Mr. Hoeffel said. Since late 2008, CMSA has been in regular discussions with policymakers and has outlined the benefits for extending TALF’s financing term to five years. Those discussions followed CMSA’s formal recommendation to the government that the Federal Reserve extend the loan term and that it make legacy commercial assets eligible for TALF. While today’s announcement by the Federal Reserve extends TALF to newly issued CMBS with a five-year term, CMSA anticipates that policymakers will extend TALF to legacy assets in the weeks ahead, as previously stated. Zero Hedge will counter with its thoughts at the earliest available opportunity. However, it is curious to note that according to this disclosure, Goldman is now fully channeling its quant trading ("high-frequency trading" as disclosed by Canaday) which is much more than "auto-quote market making" through its program trading. An immediate question for Mr. Canaday is whether Goldman Global Alpha is also part of this hi-fi trading. 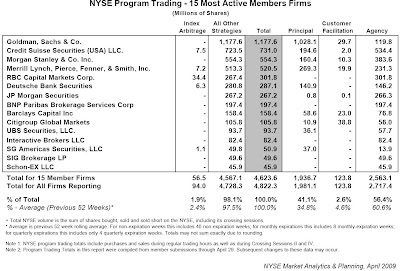 As for the SLP program, maybe GS can disclose just what is the basis of trades that according to their program trading desk provides "supplemental liquidity"? I am sure both GS shareholders and ZH readers would be happy to get much more information on this matter. Weekly NYSE program trading update. 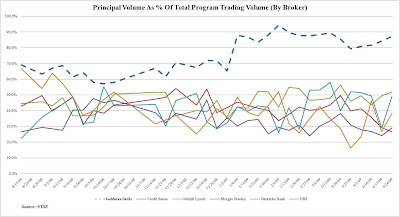 No surprise from last week, with Goldman dominating program principal trading. Curiously non-principal transactions (facilitation and agency) at Goldman are shrinking dramatically and the ratio of Principal to Non-Principal is a recent record at over 7x. 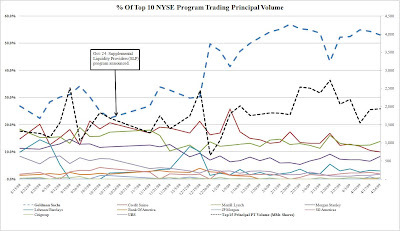 Goldman's non principal transactions are much lower than almost other top 10 NYSE member firms. 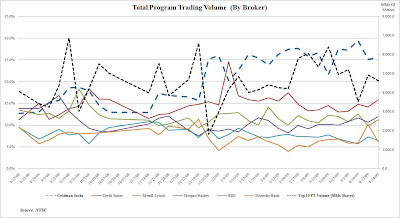 Also curiously total Program Trading volume has declined significantly from 5.1 billion shares in the prior week to 4.8 billion shares in the last week. 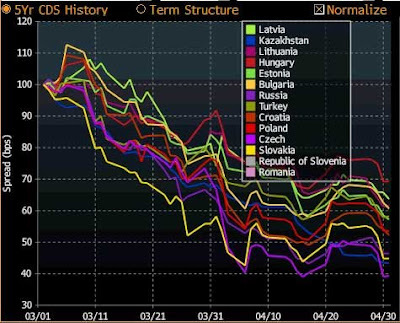 The biggest ongoing short squeeze may not be in equity markets, despite all efforts to the contrary, but rather in the risk of Eastern European countries as noted by their respective CDS levels. The chart below demonstrates the massive squeeze experienced by holders of CEE risk, which is quite entertaining considering the biggest risk powder keg by far is contained in this region. Indicatively, spreads have tightened by a massive 46% over the past 2 months which compares with Asia (39.1%), LatAm (21%) and EMEA (25.5%). Curiously Czech Republic risk is the same as China now, at 135 bps! As always, when technicals (which even in credit markets have lately been crushed) and fundamentals diverge to the point of utter nonsense, it is only a matter of time before another "risk flaring" event become all too likely. And unlike domestic corporates, when you are dealing with geopolitical aberrations, the implications will likely be much worse. And for all those who think the risk is "contained" by the IMF and the WB, please check the successful yields on the recent WB bond offering. Update: Here is the official PR. Bloomberg reports Attorney General Andrew M. Cuomo said his office has issued subpoenas to more than 100 investment firms and their agents in the investigation into possible corruption and kickback schemes involving the New York state and city pension funds. Following the March rally, consumer sentiment is up significantly according to the latest Michigan survey. The latest numbers indicate sentiment is at a recession-busting 65.1, up from March's number of 57.3 and significantly ahead of consensus numbers at 61.5. Of course, the cynics among us will attribute it to a lagging indicator that is likely to add further fuel to the fire that is the March bear rally. What is interesting is the number of people who expected unemployment to rise, fell from 61% to 53%; the impact of these numbers are up for debate. Most likely though, it's going to end in tears as those who changed their minds between last month and this month are likely to be dismayed when the "green shoots" get stamped out. A very good summary by Douglas Baird, professor at the University of Chicago law school, who analyzes the implications of the 363 sale and the (ab)use of 1129(a)(7) of the bankruptcy code on the Chrysler bankruptcy and why the first 5 days will likely be critical. In essence, this fair and equitable treatment of the case for creditors, who will likely lob objections to the 363 asset sale immediately, will be contingent on whether Judge Gonzalez will steamroll through objections in very much the same way Judge Peck gave roughly 3 nanoseconds of consideration to every creditor objection in the Lehman case before the fastest 363 sale ever, before immediately denying it. (of course referring to the "sale" of the Lehman US Broker-Dealer operations to Barclays for negative cash). If Gonzalez follows in Peck's footsteps, expect to see the Obama team try to get the 363 sale approved over the next day or two over any objections. The following analysis from AmLaw Daily is a must read for people who want to follow the salient issues in the Chrysler bankruptcy (hat tip Jack). Hello, Professor Baird. Lawyers today have been urging us to check out section 1129(a)(7) of the federal bankruptcy code, saying the bondholders who refused Treasury's deal are going to cite it to object to the Chrysler Chapter 11. We've read it, but want your expertise. What exactly does this part of the code mean? This is known as the "best interests of creditors" rule. It says each individual creditor is entitled to at least as much as they would get in a straight-up liquidation of the company. What these bondholders could say is that, if you took the Jeep brand name, the transmission business--a really successful business--the real estate, the company jets--that all of these things add up to more than $2.25 billion. Therefore, Chrysler is worth more than $2.25 billion, and a judge shouldn't be able to confirm the reorganization plan because it does not follow 1129(a)(7). That sounds like a solid argument. There's a "but" coming, now, though. Okay, tell us about that "but." The plan for Chrysler is to have a 363 asset sale before the confirmation of the Chapter 11 plan. Chrysler will ask to hold an auction for their most desirable assets and the court will conduct a sale. The new Chrysler corporation will buy those assets for $2.25 billion, and what's left for the bondholders and the rest of the creditors is that pool of cash--$2.25 billion. So by using the asset sale strategy under Section 363, Chrysler and the government are basically making objections under 1129(a)(7) moot? The bondholders can't even use that clause to argue they are not getting their fair share? Yes, the sale moots [that argument]. They will not be able to use that argument to block the sale. And all that will be left for them is the proceeds from that sale. That's it. This is what they get. So the process could go pretty quickly, considering Fiat is already on board. Is there anything the bondholders can do to upset this process? Yes. The strategy they would have to use--and the one I think they will use--is to object to the 363 sale from the outset. On what grounds can they do that? They will have to argue that it's not actually a sale--that it's an end run around their rights under 1129(a)(7)--that this not a sale, but rather a reorganization plan disguised as a sale. Thanks to traders who point out that SPY continues to be on the HTB list from market open for days on end now. Hearing grumblings about IWR as well. Everything you need to know about the dirty prehistory in the Chrysler bankruptcy, compliments of Jones Day. A must read. “One great problem that we have before us is to preserve the rights of property; and these can only be preserved if we remember that they are in less jeopardy from the Socialist and the anarchist then from the predatory man of wealth. It has become evident that to refuse to invoke the power of the nation to restrain the wrongs committed by the man of great wealth who does evil is not only to neglect the interest of the public, but is to neglect the interests of the men of means who acts honorably by his fellows." While Roosevelt’s comments made in the months preceding the panic of 1907, were not responsible for the panic itself, they fueled investor fears in the midst of a bear market a century ago. Today, following six months of vilification of the banking industry it appears there may be a new target for the Administration's populist ire “While many stakeholders made sacrifices and worked constructively, I have to tell you, some did not. In particular a group of investment firms and hedge funds decided to hold out for the prospect of an unjustified taxpayer-funded bailout.” Apparently, the talks between the Administration and Chrysler’s lenders were acrimonious and unsuccessful. From the moment the news the wire that Chrysler would be filing for bankruptcy, the Administration immediately directed the blame at the hedge funds who were senior creditors. At least in the case of banks a large degree of the Presidents statements were simply rhetoric. As we've seen several times in recent months the problem is that once the President commences a populist campaign Congress begins stampeding out of control. In the midst of a recession the investor class becomes easy targets for populist outrage. The financial markets were already preparing for a new era of regulation. Now there is legitimate concern developing within the marketplace that regulatory retribution may be in the offing for the hedge fund industry. It was only Monday we noted the tone of GM creditors indicated they believe they would get a better deal in bankruptcy court. The simple fact is the creditors are operating within their rights under the rule of law that and following their fiduciary responsibility to get what they believe to be the best deal for their investors. The President’s stance was disappointing from this perspective. Although the President may disagree with an individual, but he supports their right to freedom of speech and protest his policies in front of the White House. You have to respect an investors rights as well, even if you disagree with them. After having seen the government change so many deals in an ex-post manner, bankruptcy court may have been the only level playing field for the creditors from the beginning. Circling back to Teddy Roosevelt in 1908, Roosevelt did change his attitude towards business in the midst of the Panic. The Trustbuster himself personally provided antitrust approval for US Steel's acquisition of Tennessee, Coal & Iron (TCI) in order to prevent the failure of TCI's majority shareholder, brokerage firm Moore & Schley. Typical of any deal with the government, in 1911 President Taft (who had been Roosevelt's protégé) filed antitrust charges against US Steel for the acquisition of TCI. Looks like Bloomberg is treating the Swine Flu... pardon, the H1N1 issue a little more seriously than our green shooting friends at CNBC. For your convenience, presenting the H1N1TOTC (and H1N1TOTD) index - your friendly tracker of global infections as disclosed by the WHO. As the chart below shows, quant funds attempted to leverage five times in the month of April only to fail every single time. In the meantime the higher trading volume on both the leveraging and deleveraging phase was welcome to brokers like JPM and UBS (and maybe MS?). 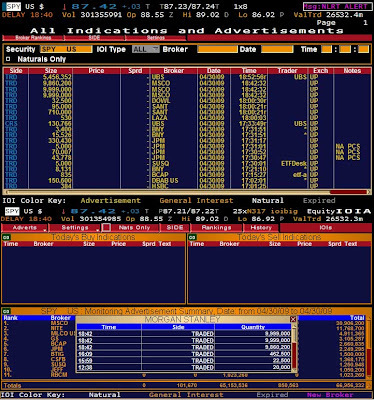 Net result, the quant performance numbers will be horrendous, as they did not succeed to catch up with their losses as the market went against every single quant factor in existence except for momo high frequency traders who played the simplest of all possible reversion patterns while the market squeezed progressively higher. As ZH reported, the pain at RIEF last week was already likely beyond fixing: this week's update will only make for some low calorie cake icing. In a replay of yesterday, Morgan Stanley advertised 30 million SPY shares traded at 6:42 pm. Curiously UBS also posted a significant accumulation block, larger than yesterday's, and indicative of some serious Prime Broker activity. Whether this was merely ETF creation by the good folks at MS or some much more serious ongoing problems at PDT it is still unclear... Or at least until M/N and L/S quant desks have to report month end numbers. Not surprisingly DB is nowhere to be found: maybe that has something to do with the fact that their quants will soon be following in the quiet footsteps of Boaz Weinstein. Spreads were tighter in the US today as all the indices improved (although the early capitulation rally gave way to OWICs and derisking as the afternoon wore on). Indices typically underperformed single-names with skews mostly narrower as IG underperformed but narrowed the skew, HVOL underperformed but narrowed the skew (but remains the richest index), ExHVOL outperformed pushing the skew wider (after getting to zero intraday), XO underperformed but compressed the skew, and HY's skew widened as it underperformed. The names having the largest impact on IG are International Lease Finance Corp. (-107.29bps) pushing IG 0.64bps tighter, and American Express Company (+15bps) adding 0.11bps to IG. HVOL is more sensitive with International Lease Finance Corp. pushing it 2.93bps tighter, and American Express Company contributing 0.5bps to HVOL's change today. The less volatile ExHVOL's move today is driven by both Viacom Inc. (-25bps) pushing the index 0.26bps tighter, and Wells Fargo & Company (+7.5bps) adding 0.07bps to ExHVOL. The price of investment grade credit rose 0.27% to around 97.34% of par, while the price of high yield credits rose 1.37% to around 79.25% of par. ABX market prices are higher (improving) by 0.22% of par or in absolute terms, 0.45%. Broadly speaking, CMBX market prices are higher (improving) by 2.68% of par. Volatility (VIX) is up 0.42pts to 36.34%, with 10Y TSY selling off (yield rising) 0.8bps to 3.12% and the 2s10s curve steepened by 5.5bps, as the cost of protection on US Treasuries fell 3bps to 39bps. 2Y swap spreads widened 1.7bps to 57.2bps, as the TED Spread tightened by 4.5bps to 0.89% and Libor-OIS improved 0.8bps to 82.4bps. The Dollar strengthened with DXY rising 0.17% to 84.614, Oil rising $0.13 to $51.1 (outperforming the dollar as the value of Oil (rebased to the value of gold) rose by 1.32% today (a 0.43% rise in the relative (dollar adjusted) value of a barrel of oil), and Gold dropping $9.46 to $888.54 as the S&P rallies (870.7 0.18%) outperforming IG credits (161.75bps 0.27%) while IG, which opened tighter at 164.5bps, underperforms HY credits. IG11 and XOver11 are -6.5bps and -3.17bps respectively while ITRX11 is -5.5bps to 138.5bps. The majority of credit curves flattened (bucking the recent steepening trend) as the vol term structure steepened with VIX/VIXV decreasing implying a more bearish/more volatile short-term outlook (normally indicative of short-term spread decompression expectations). Dispersion fell 8.1bps in IG. Broad market dispersion is a little greater than historically expected given current spread levels, indicating more general discrimination among credits than on average over the past year, and dispersion decreasing more than expected today indicating a less systemic and more idiosyncratic narrowing of the distribution of spreads. Only 51% of IG credits are shifting by more than 3bps and 67% of the CDX universe are also shifting significantly (more than the 5 day average of 63%). The number of names wider than the index increased by 2 to 43 as the day's range fell to 9.25bps (one-week average 9bps), between low bid at 156.5 and high offer at 165.75 and higher beta credits (-6.1%) outperformed lower beta credits (-1.57%), further evidence of a capitulative short-covering. In IG, wideners were outpaced by tighteners by around 8-to-1 (but the majority were well off their intraday tights by the close), with 26 credits wider. By sector, CONS saw 24% names wider, ENRGs 19% names wider, FINLs 33% names wider, INDUs 14% names wider, and TMTs 13% names wider. Focusing on non-financials, Europe (ITRX Main exFINLS) underperformed US (IG12 exFINLs) with the former trading at 137.47bps and the latter at 127.27bps. Cross Market, we are seeing the HY-XOver spread compressing to 326.57bps from 376.9bps, but remains below the short-term average of 412.41bps, with the HY/XOver ratio falling to 1.4x, below its 5-day mean of 1.49x. The IG-Main spread compressed to 23.25bps from 24bps, but remains below the short-term average of 24.5bps, with the IG/Main ratio rising to 1.17x, above its 5-day mean of 1.16x. In the US, non-financials outperformed financials as IG ExFINLs are tighter by 5.6bps to 127.3bps, with 73 of the 104 names tighter. while among US Financials, the CDR Counterparty Risk Index fell 2.51bps to 227.17bps, with Brokers (worst) wider by 1.44bps to 284.58bps, Finance names (best) tighter by 47.43bps to 947.86bps, and Banks wider by 0.26bps to 285.97bps. Monolines are trading tighter on average by -44.82bps (1.36%) to 2728.76bps. In IG, FINLs underperformed non-FINLs (3.79% tighter to 4.24% tighter respectively), with the former (IG FINLs) tighter by 17.9bps to 454.8bps, with 13 of the 21 names tighter. The IG CDS market (as per CDX) is 4.5bps cheap (we'd expect LQD to underperform TLH) to the LQD-TLH-implied valuation of investment grade credit (157.29bps), with the bond ETFs underperforming the IG CDS market by around 5.09bps. In Europe, ITRX Main ex-FINLs (underperforming FINLs) rallied 5bps to 137.47bps (with ITRX FINLs -trending tighter- better by 7.51 to 142.63bps) and is currently trading tight to its week's range at 0%, between 154.64 to 137.47bps, and is trending tighter. Main LoVOL (trend tighter) is currently trading tight to its week's range at 0.01%, between 111.28 to 97.13bps. ExHVOL underperformed LoVOL as the differential decompressed to -4.3bps from -5.19bps, but remains below the short-term average of -4.05bps. The Main exFINLS to IG ExHVOL differential compressed to 44.64bps from 46.74bps, and remains below the short-term average of 46.42bps. CDR LQD 50 NAIG091 -4.68bps to 217.79 (14 wider - 30 tighter <> 14 steeper - 35 flatter). CDX12 IG -6.25bps to 161.75 ($0.27 to $97.34) (FV -7.52bps to 177.55) (26 wider - 86 tighter <> 43 steeper - 81 flatter) - Trend Tighter. CDX12 HVOL -16.85bps to 380 (FV -24.43bps to 482.55) (5 wider - 24 tighter <> 11 steeper - 19 flatter) - Trend Tighter. CDX12 ExHVOL -2.9bps to 92.83 (FV -2.78bps to 97.27) (21 wider - 74 tighter <> 62 steeper - 33 flatter). CDX11 XO -17.8bps to 369.6 (FV -24.39bps to 434.63) (3 wider - 29 tighter <> 17 steeper - 17 flatter) - Trend Tighter. CDX12 HY (30% recovery) Px $+1.37 to $79.25 / -53.5bps to 1142.1 (FV -95.3bps to 1053.19) (4 wider - 95 tighter <> 79 steeper - 20 flatter) - Trend Tighter. LCDX12 (65% recovery) Px $+1 to $77.5 / -72.19bps to 1092.39 - Trend Tighter. MCDX12 -0.33bps to 195bps. - Trend Tighter. CDR Counterparty Risk Index fell 2.51bps (-1.09%) to 227.17bps (5 wider - 10 tighter). CDR Government Risk Index fell 4.42bps (-6.07%) to 68.45bps. DXY strengthened 0.17% to 84.61. Oil rose $0.13 to $51.1. Gold fell $9.46 to $888.54. VIX increased 0.42pts to 36.34%. 10Y US Treasury yields rose 0.8bps to 3.12%. Duke Realty: We are raising our '09 and '10 estimates while our PO increases from $9 to $10. Maintain Neutral rating. Kimco: Maintaining Buy rating due to the KIMs improved balance sheet strength as a result of its add-on offering. While retail fundamentals should remain weak for 09, KIMs should be one of the survivors. Boston Properties: BXP's 1Q results solid; increasing FFO. BXP reported normalized 1Q09 FFOPS of $1.30/share when you exclude the $0.19 one-time, non-cash impairment charge related to the suspension of construction at 250 West 55th Street. ProLogis Trust: Significant progress toward deleveraging. PLD has taken meaningful steps to improve its balance sheet although it comes with a near-term cost of earnings dilution. We are trimming our '09 and '10 estimates while our PO falls to $9.50. Avalon Bay: Despite stronger than expected Q1 results we are lowering our rating from Buy to Neutral due to the recent stock price gains coupled with weakening fundamentals. Our new PO is $55 (up from $49). Equity Residential: EQR reported 1Q09 FFO of $0.57 which was a few pennies above our forecast. We are raising our '09 and '10 FFO estimates by a nickel while our PO increases from $18.00 to $18.50. Weingarten Realty: Maintaining 09 Est., despite 1Q surprise: We are maintaining our price objective of $13 for WRI. This assumes a 5% discount to its forward NAV. Maintain Underperform based on PO and WRI recent outperformance of REIT sector. AMB Property Corp: Well positioned to weather the storm: AMB reported better than expected Q1 results due to higher than expected gains on development sales. We are maintaining our Neutral rating but raising our PO from $16 to $19 per share. SL Green: SLG's results beat on one-time items. SLG reported 1Q09 FFO of $1.48. We are increasing our 09 FFOPS estimate by $0.17 to $5.67, while our PO increased $2 to $16.50, in line with our forward NAV estimate. Now that all REITs are solidly recapitalized and chasing the 3 still non-bankrupt retail tenants with 100%-off rent offers, maybe it is time for the custodians to allow investors to short again. One of these days SPY and IWR may finally not be Hard To Borrow - who knows? Mack-Cali Realty Corporation (the “Company”) (NYSE: CLI) today announced that it has commenced a public offering of 6,500,000 shares of common stock. In addition, the Company expects to grant to the underwriters for the public offering an option for 30 days to purchase up to 975,000 additional shares of common stock to cover overallotments, if any. Merrill Lynch & Co. and Deutsche Bank Securities will serve as the joint book-running managers. The Company plans to use the net proceeds from the offering to repay borrowings under its unsecured revolving credit facility and for general corporate purposes. This offering will be made pursuant to a prospectus supplement to the Company’s prospectus, dated November 26, 2008, filed as part of the Company’s effective $2 billion shelf registration statement. 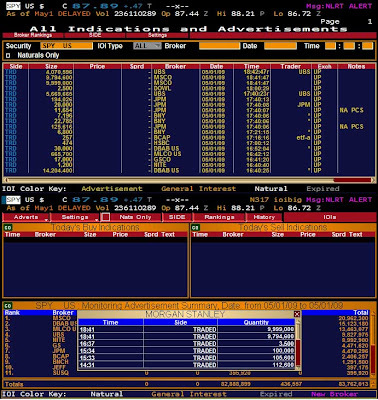 This press release shall not constitute an offer to sell or the solicitation of an offer to buy any securities nor will there be any sale of these securities in any state in which such offer, solicitation or sale would be unlawful prior to registration or qualification under the securities laws of any such state.